A savvy design and construction team transforms a home suffering from decades of mismatched renos into a modern masterpiece of exceptional grandeur. ALL PHOTOGRAPHY BY JANIS NICOLBY. The entryway of the house was designed to be as grand as the living room that follows. 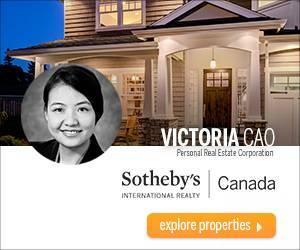 Merle Alexander knew he’d found his dream home the moment he stepped into the “great room” of the house in the Arbutus area of Victoria. With its 18-foot ceilings, arched windows, spectacular views and lustrous natural light, it was as breathtaking as it was enormous. Of course, the house had its flaws. It was a representation of every decade since it was built in 1928. It had bedrooms conceived in the 90s, vinyl linoleum in a 70s kitchen and bathrooms painted in aqua tones of the 60s. It took some convincing for Alexander’s partner, Tamara Napoleon, to see the same vision he had, but eventually the two would turn this historical melting pot into their own legacy home — a home as timeless as it is beautiful — in which to grow their family. 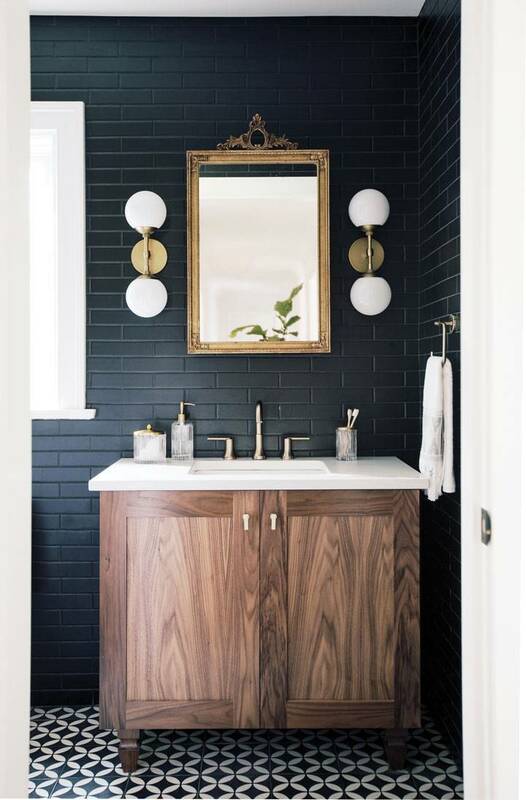 Using a stylish mix of black-and-white motifs and classic tile throughout the house, the couple did just that. First, though, a large-scale overhaul was necessary to streamline the home for modern-family living. In the original structure, a strange hallway cut through one bathroom, which opened into a small den before leading through to a bedroom. Chris Strong, principal at Strong Construction Group, says it took some reimagining to make the space come together. His greatest accomplishment was the revised kitchen and dining area, created by opening a closed-off eating room and galley-style kitchen. Despite the restructuring, there was a great deal of original beauty in the house — from the shapely windows to the natural oak flooring. While most Victorian homes of the era held to a traditional standard, the original owners of the Arbutus house contracted an architect from San Francisco, bringing in design and style not commonly seen here. At a leisurely 5,500 square feet, including the basement, it was quite the “summer cottage” for the first family. Through the years, the home shapeshifted with each new owner’s insight, right down to faux-candle light fixtures adorning the walls. Yet the great room kept its striking features, with exposed beams and wood-sashed windows. To help it come alive again, Strong’s team freshened the plaster walls, repainted the natural detail in the moulding and refurbished the fireplace back to its centrepiece stature. Leading the redesign, Bidgood’s team enhanced even the subtler details of the house to build an almost imperceptible repetition throughout each space. 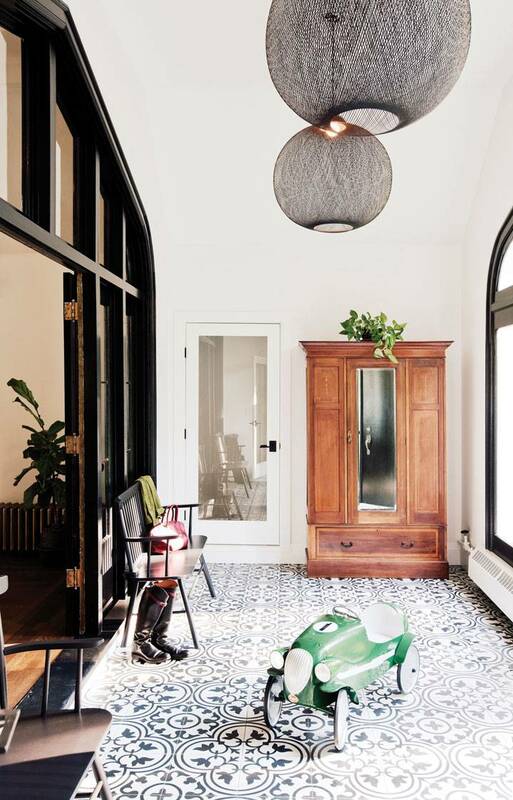 The team added an archway to the living area, brought in Edison bulbs and modern light sconces, placed subway tiles in the powder room and even recreated the arch of the great room within some tile patterns throughout the house. Parallel-placed Random Light pendant chandeliers by Moooi offset the Decora Tile black-and-white tile flooring and subtly capture the arch of the door frame in their design. The salvaged armoire, refurbished by Island Custom Cabinetry, gives the room a warm and homey feel. 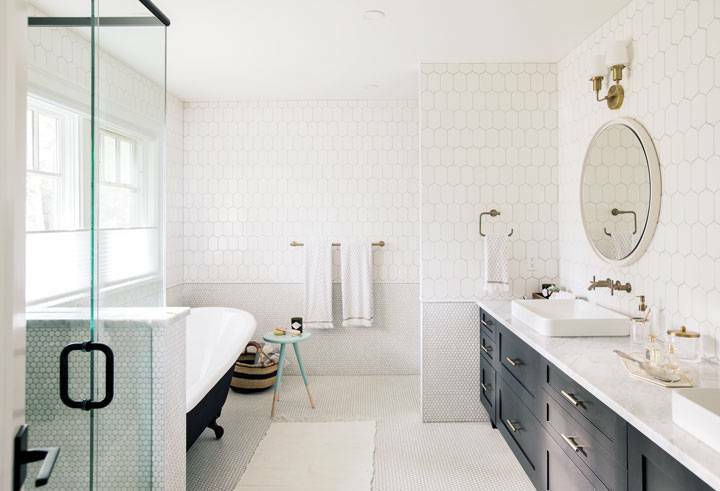 Turning a mosaic of styles into one classic look was the mission of designer Kyla Bidgwood + Co. Interiors. Patterns reappear throughout the house, some so subtle that visitors would know only that it all fits together. The tile of the fireplace draws the eye into this classic centrepiece, using Cement Tile Shop’s Bordeaux pattern. 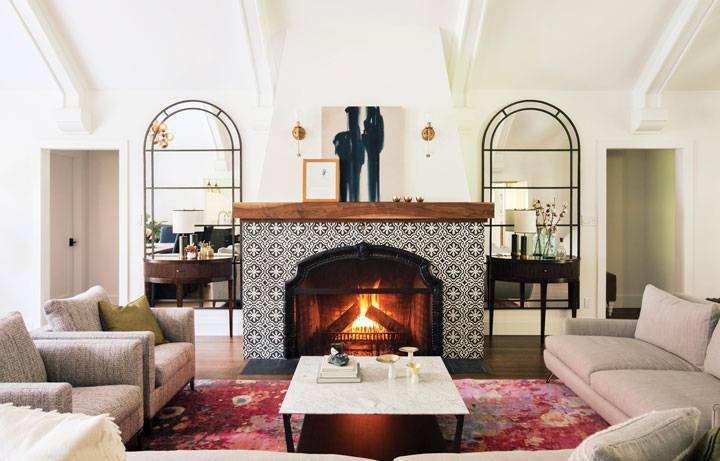 The arch of the entryway reappears in the great room, from the beams of the roof’s structure to the rounded frame of the fireplace’s hearth and twin-arched Restoration Hardware mirrors. The dining area of the house reflects more parallels, showcasing a window wall that mimics the entryway. Staying true to the home’s history was a priority for the homeowners, so Bidgood made use of reclaimed objects, like the dining room’s vintage radiator. 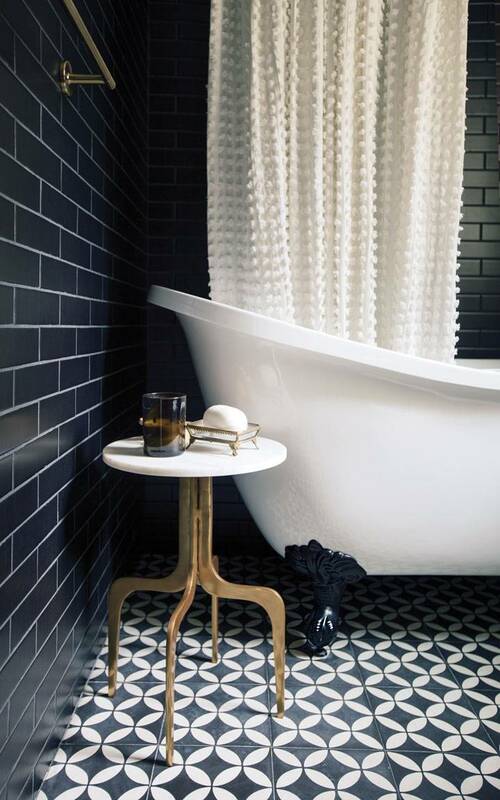 Bidgood’s favourite room in the house is the main bathroom with its striking black tile, as it makes a strong statement for such a contained space. The scrolling in the mirror from Pigeonhole Home Store reflects the classic antique tones of the house, while twin globe Arteriors wall sconces hint at the modern theme. 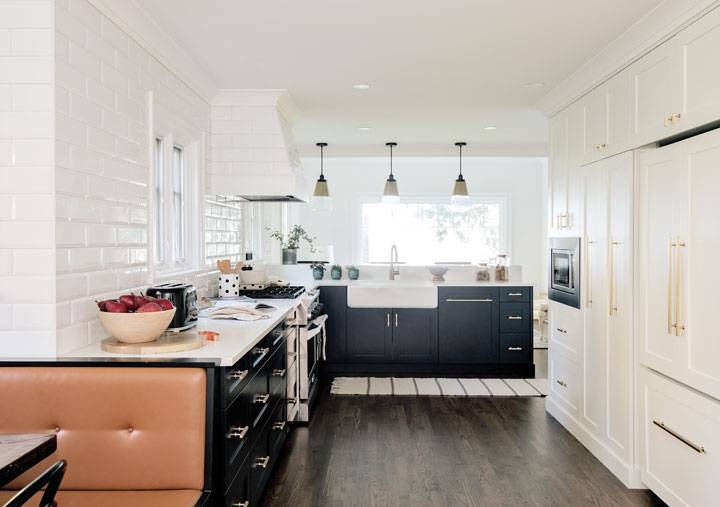 The kitchen renovation was a personal achievement for builder Chris Strong. Turning this space from a closed galley-style runway to an open area where the family could gather was a reward in itself, Strong says. 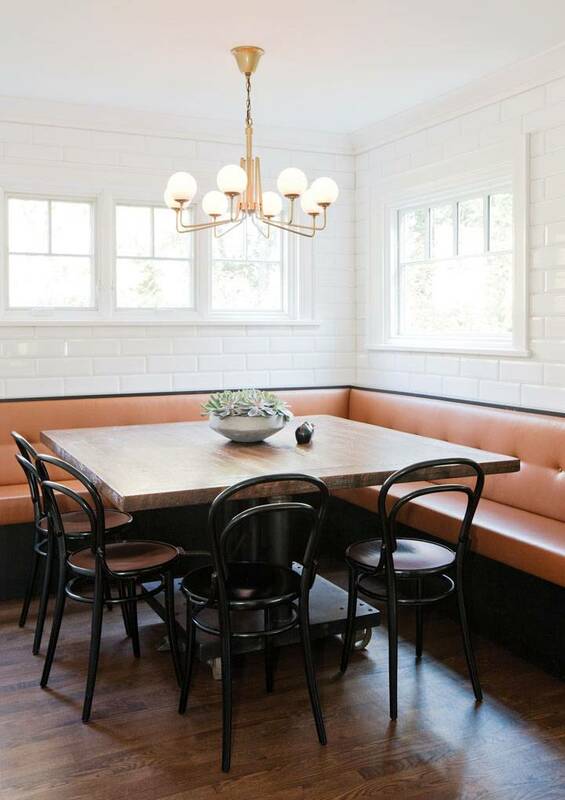 To stay playful with the contemporary themes first found in the house, the dining nook features a custom 70s-style burnt-orange bench, crafted by Strong Construction. 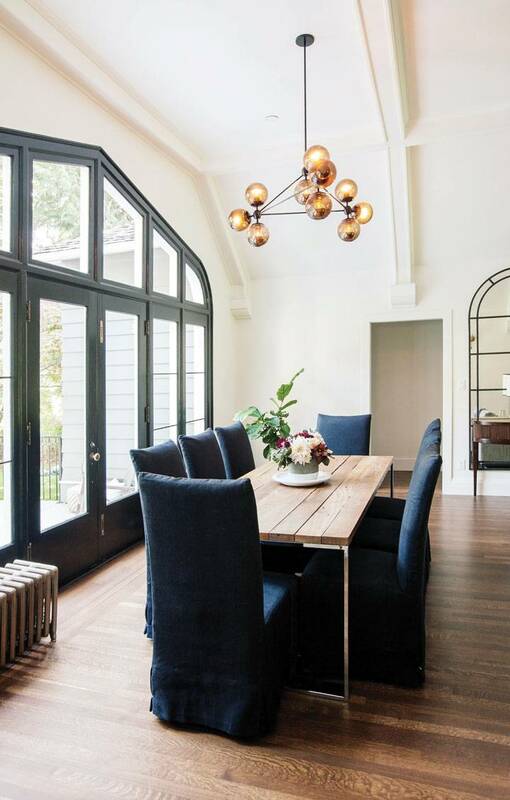 The refurbished table by Scott Landon Antiques and Michael Thonet Era chairs from Design Within Reach give a modern vintage feel when paired with the Noir chandelier from Luxe Home Interiors. Light is elevated in this once gloomy area, with all-white tiles from Olympia Tile reflecting bright sheen from the windows. Pendant lamps from Feiss balance the bright layout, and Lewis Dolin cabinet hardware wraps in the gold tones found in the main living area.